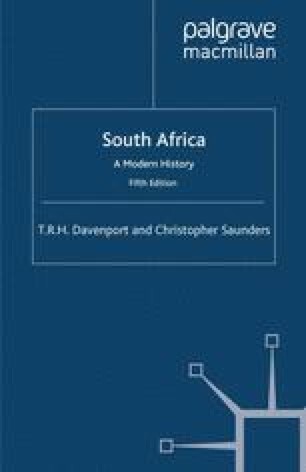 Successive British cabinets through the nineteenth century debated the merits of formal and informal empire in southern Africa. After many changes of policy it was eventually decided in 1899 to make war against the Boer republics in order to establish a firm paramountcy over the whole region. The events leading up to this decision have provided much fodder for the twentieth-century debate over the meaning of imperialism, in which several strands of argument may be discerned. Thus the role of the humanitarian lobby, seldom if ever dominant, yet seldom so insignificant that politicians of either party could afford to ignore it, was deplored in the later writings of G. M. Theal, and commended in those of W. M. Macmillan, but neither doubted its importance. Others, notably J. S. Galbraith, have seen the hand of the British Treasury as the ruling influence in the formulation of British policy, ‘reluctantly’ extending the imperial frontiers, and economising in the use of governmental and military resources. Considerations of grand strategy dominated the thinking of leading imperialists, in the view of Robinson and Gallagher. Others have traced the key initiatives less to the Colonial Office than to the periphery. Benyon, for example, has displayed the innovatory role of a succession of Imperial high commissioners. ‘Peripheral imperialism’, as Kubicek and Schreuder have described it, was rather the work of ‘subcontracting’ merchants and land-seekers in the colonies themselves.